37 years ago, a group of like-minded Porsche enthusiasts gathered in a dealership parking lot to swap 356 parts and share stories. 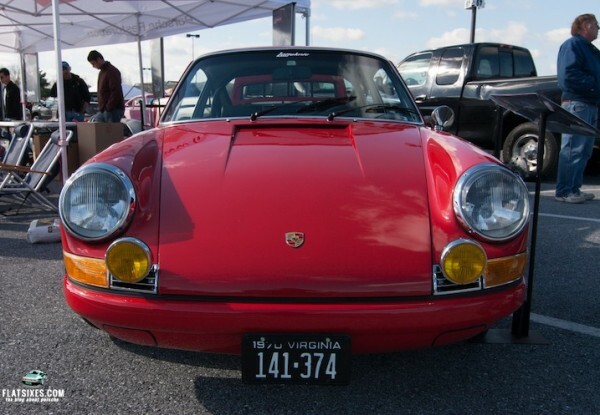 That was the humble beginnings of what is now the worlds largest Porsche only swap meet hosted by the Central Pennsylvania PCA Region. 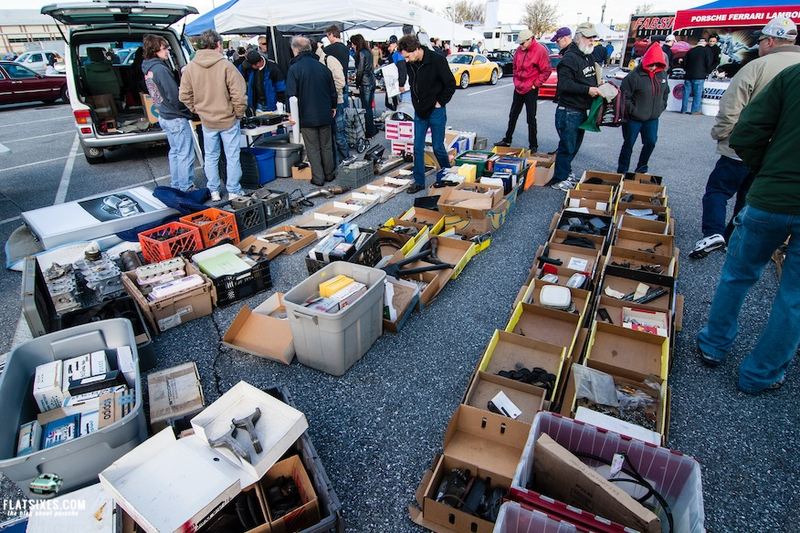 From that initial gathering of a dozen people, the swap meet has grown each year, outgrowing various hosting locations along the way to the current location in Hershey Park. Browse through our pictures below or read a full account of the weekend starting just after the picture gallery. At its current venue, between 1500 and 5000 people show up each spring for the swap meet, with the weather determining the size of the crowd. In talking to Steve Baun, the event chair, I found out that nearly 900 vendor spaces were rented out this year with the farthest vendor coming all the way from Italy! His pre-event advice was to get there right at 8am as by noon things start to wind down. Hershey, for some, marks the beginning of driving season and a reason to get their cars out of winter hibernation; for others, it's a chance to find that rare part they've been searching for all winter while working on their latest restoration project or catch some early season vendor sales, and for still others, it's little more than an excuse to meet up with old friends. For me, since I've never been before and I have no restorations projects, I decided to attend just to see what the event was like and to get an early season Porsche fix. So with my trusty Canon camera at my side and an open mind, I headed to Hershey. Traveling to Hershey from Ohio on Friday it was raining heavily with a fierce wind blowing things sideways but the forecast was still for dry weather on Saturday so I kept my fingers crossed that it would all blow through over night. Saturday morning arrived and it was dry out but the temperatures had plummeted about 25 degrees overnight down to about 50 degrees. Getting to the event early, like Steve had suggested, made things easy and the local PCA volunteers directing traffic made parking a breeze. Some of the big vendors like Rennline were right up front. They had a nice collection of cars around their product display area that, as you can imagine, had a heavy applications of Rennline parts on them. I knew going in that the event was big but I guess I had underestimated it in my mental picture of the event. With so many vendor spots to look at, I did a quick once over of everything and then when back to talk with folks in more detail. My unscientific estimation was about half the "vendors" were just regular folks selling parts they had collected over the years and the other half being actual businesses looking to move inventory. Some vendors were more organized than others. I quickly realized how limited my Porsche part knowledge was. Some things I looked at and had no idea what there were or what car they were for. I'm sure there's somebody who looked in this bin and thought "that's exactly what I need!". Once I had finished that preliminary reconnaissance, I went back through and took the time to talk to people and to try to understand what keeps them coming back to Hershey. When I talked to Anthony Miller at Translog, he said he does the event mainly to help support the local PCA chapter and as a way to meet people. 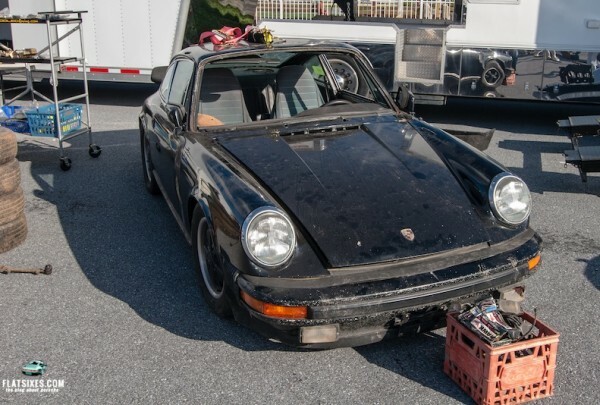 Translog has been a fixture in the central Pennsylvania Porsche scene for 2 generations now, originally with Gary Wigglesworth and now with Anthony heading up the shop. Anthony had on display a Kharmann Ghia bodied Boxster S that has been written about previously on FlatSixes and a really cool glass table with an old Porsche engine as the base. BTW, that Ghia took nearly 3 years to complete! A little further down, I caught up with Per Schroeder, who I knew from his days at Grassroots Motorsports magazine. He is now working for Stoddard NLA. Stoddard sells quite a bit of goods at the show, with some of their best deals in their scratch & dent/shipping damaged section, but they also have a lot of their new products on display just to help get the word out on their ever expanding product line up. When I was passing by the Lufteknic booth, their limited edition prints caught my eye and my wallet. 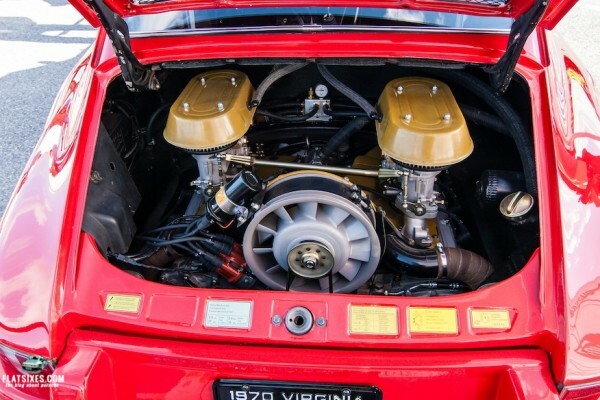 After carefully storing my purchased print away, I chatted with Lufteknic's Terry Overholser about the beautifully restored 1970 911E they had on display. There are some good stories behind this car that is still owned by the original owner. Lufteknic's attention to detail and focus on preserving Porsches makes them a place I would definitely check out for my own car if I lived down in the Richmond, VA area. Just take a look at some of their projects. Beside all of new & used Porsche parts that you expect to see, there were some innovative products as well. For example, this simple way to add cup holder in your 911; it attaches to the end of your seat rail. I found one of the more innovative products when I stopped and talked with Todd Candey of Helion Composites to took a look at the one piece composite Targa top they are working on bringing to market. Todd had the "first off" part at Hershey to start generating some interest. Looks like it will be a great product for those that are no longer interesting in continuing to fix their original equipment Targa tops. There was even a lot just for cars that were for sale. This nice mid-year car in Ice Green Metallic was one of the ones that caught my eye. However, of all the cars I saw in the for sale lot, a certain Dark Blue Metallic RS America was probably the one that called out to me the most. Some cars for sale needed more work than others. Beside stuff for sale, even the event parking was interesting because of the large section reserved for just Porsches. Wandering through there was a like an encyclopedia of Porsche production history, not to mention the largest collections of Porsches in one place that I think I have ever seen, but surprisingly none of those original cars drew as much attention as this clean Beck 904 replica You definitely don't see one of these very often. One of the final things I looked at was the concours section. But by then my feet were beat and I didn't stay there long before heading out to find a warm place to eat lunch. From all the smiling faces I saw, I think everyone who attended had a good time. This is definitely an event that should be on every Porsche fan's yearly calendar. What Do You Think of the Porsche Boxster S “Red 7”? Haven’t been to Hershey for a few years now. Asking if there may have been a model of the 1976-1977 911 Carrera 3.0 represented there? 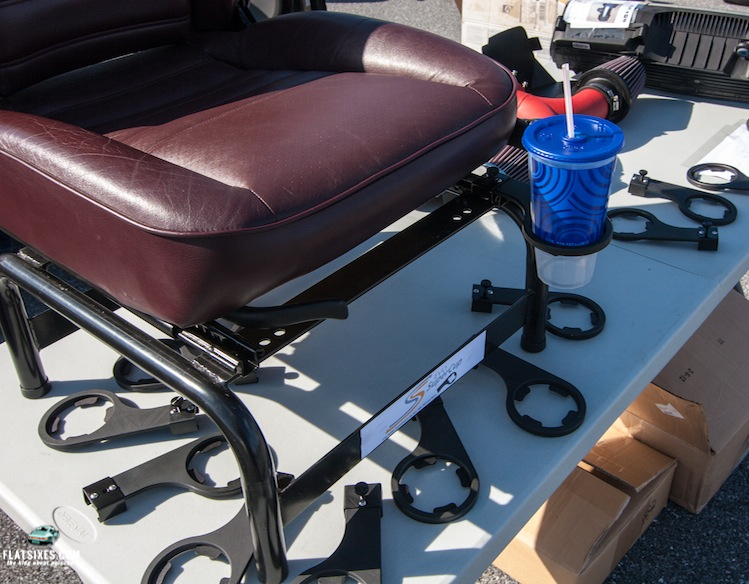 Can you provide us with the name or contact information for the Cup Holder for 911’s you show in the article, please. Also available through vendors like Pelican, Apex Performance, etc.. It was rather cold out there but worth it. Like everyone else, that 904 was a magnet for me. I also spent an inordinate amount of time at the Ghia/Boxster which was too cool. But since I really like to see Porsche’s off road, the Rothmans 959 was probably my favorite, although I’m pretty sure it was a tribute car. Anyone know for sure?